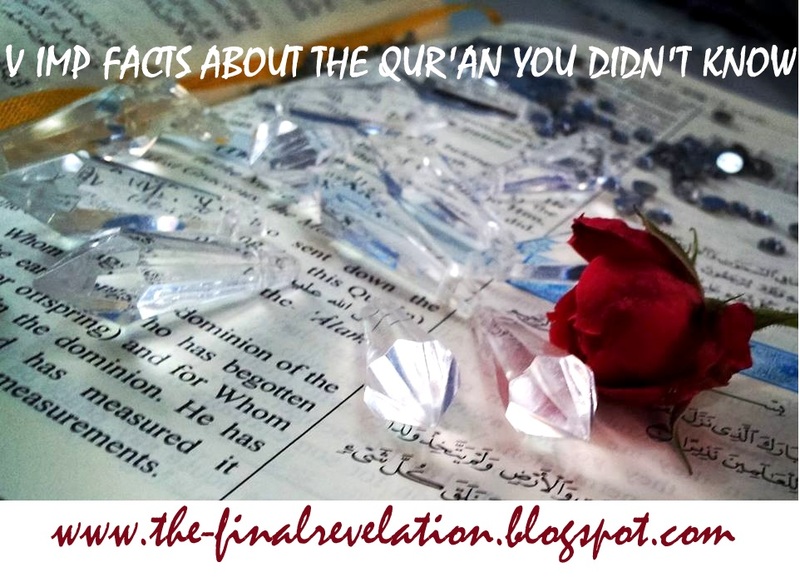 V IMP FACTS ABOUT THE QURAN WHICH YOU DIDN'T KNOW ! The Qur'an offers freedom of faith (10:108, 6:104, 10:99, 39:41, 11:121, 73:19, 43:88-89, 2:272, 76:29, 18:29, 42:48, 76:2-3, 3:20, 88:21-22, 16:82-83, etc. ), freedom of religion (2:256, 109:6, 22:67-69, 42:15, 10:41, 2:139, 42:6, etc. ), and freedom of freethinking (15:3, 17:84, 6:110, 10:11, 11:121, 52:45, etc.) without any temporal punishment. The Qur'an teaches to believe in all the previous Prophets of God as they represent the chain of evolution of the Prophethood (2:1-4, 3:84, 2:285, 4:152, 37:37, etc.). The Qur'an teaches that Islam is for everyone (2:62, 22:17, 21:107, 2:111-112, 5:69, 34:28, 103:1-3, 22:67, 10:47, 35:24, 16:36, 68:52, 49:13, 4:1, 2:213, 10:19, 17:70, etc.). The Qur'an teaches love, mercy, kindness, and forgiveness (1:1-2, 85:14, 21:107, 60:7, 4:17, 7:199, 39:53, 16:119, 3:159, 15:85, 16:119, 19:96, 2:160, 2:163, 4:27-28, etc.). The Qur'an is the only non-Jewish scripture in the world where Jews have been honored and protected in so many verses (2:40, 2:47-52, 2:57-58, 5:20, 5:44, 10:47, 10:90-93, 14:6, 17:2-3, 20:47-52, 20:77-80, 44:30-32, 45:16, etc. ), good Jews have been praised and they have also been offered salvation if they follow the true teachings of Moses (2:62, 2:121-122, 3:113-115, 3:199, 5:12, 5:65-66, 5:69, 29:46, etc.). The Qur'an is the only non-Christian scripture in the world where Jesus and Mary have been honored with very high respect (3:42-55, 5:44-46, 5:110, 43:59, Chapter 19 on Mary, etc. ), good Christians have been praised and they have also been offered salvation if they follow the true teachings of Jesus (2:62, 2:121-122, 3:113-115, 3:199, 5:65-66, 5:69, 5:82, 29:46, etc.). Unlike Bible that prescribes death penalty for idolatry and polytheism (Deuteronomy 17:3-5, 13:6-16; 2 Chronicles 15:13; Ephesians 5:5; Revelation 21:8; 1 Corinthians 6:9-10; Exodus 20:4-5; etc. ), the Qur'an doesn't have any temporal punishment for the same (22:17, 6:107-8, 22:67-69, 17:84, 49:11). The Qur'an teaches that the pre-Qur'anic people will be judged according to their own deeds and actions (2:134, 10:47, 35:24, 16:36, 40:78, 4:164, 17:15, 62:5, 5:44, 20:133-4, etc.). The Qur'an is the only religious Book that strongly condemns female infanticide (16:58-59, 81:8-9, 6:137, 6:140, 6:151, 17:31). The Qur'an teaches in various ways to free the slaves that come into possession as a result of war (90:12-13, 9:60, 5:89, 2:177, 4:3, 4:25, 4:92, 24:33, 58:3, 8:67, 47:4, etc.). The Qur'an strongly condemns terrorism and oppression (4:75, 22:39-40, 9:13-14, 42:39-43, 38:28, 2:190-193). The Qur'an strongly condemns unjust killing and suicide (5:32, 2:195, 4:29-30, 4:91-93, 17:31, 17:33, 6:151, 25:68, 3:21, etc.). The Qur'an teaches self-defense and tolerance (60:7-9, 2:190-3, 6:107-8, 6:68, 49:11, 39:3, 16:126-128, 73:10, 19:46-47, etc.). The Qur'an advises Muslims not to take terrorists, intolerant, slanderers, and haters as friends and protectors (5:51, 3:28, 5:57-61, 60:7-9, 3:118, etc.). The Qur'an strongly condemns priesthood and religious peddlers (2:41, 2:79, 5:44, 3:187, 9:9, 9:31, 9:34, 2:174, 12:104, etc.). The Qur'an strongly forbids eating up others' property (2:188, 4:2, 4:10, 4:161, etc.). The Qur'an strongly condemns defrauders (83:1-4, 55:7-9, 17:35, 6:152, etc.). The Qur'an teaches not to follow feeble oath-monger, slanderer, greedy, and hinderer of the good (68:10-13, 49:11-12). The Qur'an teaches to follow the middle and straight path (17:29, 25:67, 2:143, 23:62, 4:171, 17:9, 2:286). The Qur'an gives equal status and rights to men and women (with certain exceptions for overall benefit) (4:1, 4:7, 4:124, 3:195, 16:97, 33:35, 49:13, etc.). The Qur'an is probably the only religious Book where women have the right to inherit (4:7). The Qur'an gives rights and dignity to orphans, needy, and widows (2:177, 2:115, 2:220, 2:240-241, 4:2, 4:8, 4:10, 4:36, 9:60, 17:26, 17:34, 93:9-10, 89:17-18, 6:152, 107:1-3, etc.). The Qur'an encourages men to give dower to women as free gift whom they marry (4:4). The Qur'an teaches to give charity to poor and needy (2:43, 2:177, 2:277, etc.). The Qur'an protects women's dignity from wicked men (24:4, 24:23). The Qur'an teaches that widow can re-marry if she wishes (2:234-240). The Qur'an teaches that woman can get divorce if she wishes (2:228-232). The Qur'an teaches that divorced woman can re-marry if she wishes (2:229, 2:232). The Qur'an teaches to be kind, helpful, and respectful to your parents (29:8, 17:23, 46:15, 19:14, 6:151, 4:36, 2:215, 2:83, 71:28, etc.). The Qur'an forbids marrying one's mother, daughters, sisters, and many other close relatives (4:22-23). The Qur'an encourages both men and women to be modest and chaste (7:26-28, 24:30-31, 33:59, 2:268, 17:32, etc.). The Qur'an prescribes hundred stripes as a symbol of punishment for adultery and fornication to keep the society healthy (24:2). The Qur'an strongly discourages intoxicants and gambling (5:90-91). The Qur'an forbids eating dead animals, ferocious animals, blood, and pork (16:115). The Qur'an condemns bad magic that may harm gullible people (2:102). The Qur'an teaches to strive for good works (2:148). The Qur'an teaches not to lie and not to mix up truth with falsehood (45:7, 2:42, 52:11-12, 3:94, 3:71, 39:3, etc.). The Qur'an encourages people for seeking knowledge and asking question (17:36, 39:9, 47:24, 25:33, 38:29, 17:85, 21:7, 2:215-220, etc.). The Qur'an teaches not to ask those types of questions, which may cause you pain and trouble (5:101). The Qur'an teaches not to follow conjecture (10:36, 17:36, 49:12). The Qur'an teaches, contrary to the superstitious belief of the then Arabs, that adopted son and biological son are not the same (33:4-5). The Qur'an teaches that majority may not be granted (6:116). The Qur'an encourages traveling (29:20, 22:46, 6:11, 40:21, 47:10, 30:42, 3:137, etc.). The Qur'an offers practical Golden Rule that can be followed (2:44, 41:34, 11:88, 60:7-9, 61:2-3, 8:61; Sahih Bukhari 8:73:26, 1:2:12). The Qur'an teaches to invite people to the Way of thy Lord with wisdom and beautiful preaching and to reason with them in ways that are best and most gracious (16:125). The Qur'an teaches to argue with the People of the Book in the best manner (29:46). The Qur'an teaches that God begets not, nor is He begotten as begetting is an un-Godly act (112:3, 4:171, 19:35, 10:68, 19:88-92, 5:75, etc.). Both the Qur'an and Bible teach that Jesus was a human (Acts 2:22; Qur'an 5:75, 25:20) and a Prophet of God (Matthew 21:11, Luke 24:19; Qur'an 2:87). The Qur'an teaches not to believe in Trinity as Jesus himself never preached this kind of irrational doctrine (Mark 12:29; Qur'an 4:171, 5:73). The Qur'an teaches not to believe in Original Sin as it is falsely claimed that Jesus (pbuh) himself preached this kind of inhumane doctrine (Ezekiel 18:20; Qur'an 17:15, 6:164, 53:38). The Qur'an invites people from the depth of Darkness into Light (14:1, 57:9). The Qur'an teaches not to practice monasticism as it is an impractical way of life (57:27). The Qur'an teaches to have Imaan (conviction) in The One and Only Unseen God (2:3, 112:1-4, 67:12, 36:11, 42:51, etc.). The Qur'an offers falsification test and challenge for the skeptics to falsify its Divine Claim (4:82, 17:88, 2:23-24, 10:37, etc.). The Qur'an very emphatically and uniquely claims to be the Revelation from the Lord of the Worlds in so many verses (4:82, 17:88, 2:23-24, 10:37, 32:2, 26:192-4, 16:102, 36:5, 42:51-53, 41:52-53, 56:77-82, 69:40-51, 25:4-6, etc.). The Qur'an offers various logics for the unbelievers of Creator (22:5, 75:36-40, 22:73, 23:91, 2:28, 17:99, 19:66-67, 21:22, 29:46, 6:99, etc.). The Qur'an ensures absolute justice in this world and in the hereafter (4:135, 5:8, 4:58, 57:25, 39:69-70, 40:17, 21:47, 36:54, 2:281, 7:29, 16:111, 17:13-15, 20:134-135, 4:123, etc.). The Qur'an teaches that this temporal world is a test for the hereafter (18:7, 67:2, 2:155, 2:214, 29:2-3), and each and every individual will be judged perfectly according to his/her own deeds and actions (36:54, 4:85, 40:17, 21:47, 36:54, 2:281, 7:29, 16:111, 17:13-15, 20:134-135, 42:24, 4:123). The Qur'an promises eternal peace and salvation in the hereafter (85:11, 4:122, 14:23, 19:60-61, 32:19, 2:25, 2:112, 16:97, 4:124, etc. ).